A Code Blue for rough sleepers has been activated on Wednesday 16 August to Friday 18 August, to provide extra support to homeless South Australians during the cold and wet forecast conditions. Hutt St Centre opening from 5pm Wednesday 16 August through to 7am Friday 18 August to provide overnight shelter for people rough sleeping. The Hutt St Centre is located at 258 Hutt St, Adelaide. Street Crew will be connecting with people sleeping rough throughout this period. The Homelessness Gateway Service will continue to operate 24 hours a day 7 days a week. 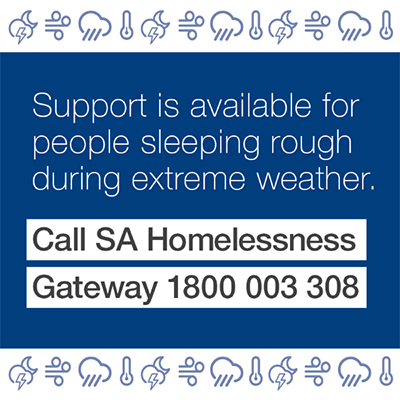 Anyone who is homeless or at risk of homelessness is encouraged to contact the Homelessness Gateway on 1800 003 308.